10,000 Silver Bright TamperVoid Metallic Tamper Evident Security Labels Seal Sticker, Round/ Circle 0.5" diameter (13mm). Custom Print. >Click on item details to customize it. 5000 Silver Bright TamperVoid Metallic Tamper Evident Security Labels Seal Sticker, Round/ Circle 0.625" diameter (16mm). Printed: Warranty Void if Removed + Serial Number 2000 Silver Bright TamperVoid Metallic Tamper Evident Security Labels Seal Sticker, Round/ Circle 0.5" diameter (13mm). Printed: Warranty Void if Removed + Serial Number 5000 Silver Bright TamperVoid Metallic Tamper Evident Security Labels Seal Sticker, Rectangle 1.5" x 0.6" (38mm x 15mm). Custom Print. >Click on item details to customize it. 250 Silver Bright TamperVoid Metallic Tamper Evident Security Labels Seal Sticker, Rectangle 0.75" x 0.25" (19mm x 6mm). Printed: Warranty Void if Label Removed. 250 Silver Bright TamperVoid Metallic Tamper Evident Security Labels Seal Sticker, Round/ Circle 0.5" diameter (13mm). 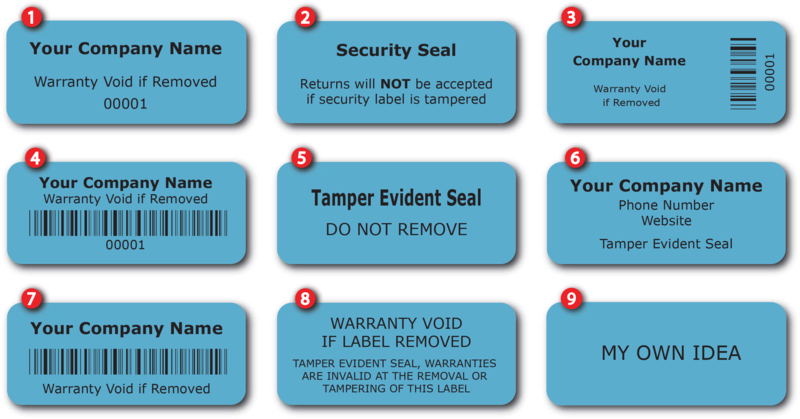 Printed: Warranty Void if Removed + Serial Number 250 Silver Bright TamperVoid Metallic Tamper Evident Security Labels Seal Sticker, Rectangle 2" x 0.75" (51mm x 19mm). Custom Print. >Click on item details to customize it. 1000 Silver Bright TamperVoid Metallic Tamper Evident Security Labels Seal Sticker, Rectangle 1" x 0.5" (25mm x 13mm). Printed: Warranty Void if Label Removed. 500 Silver Bright TamperVoid Metallic Tamper Evident Security Labels Seal Sticker, Rectangle 2.75" x 1" (70mm x 25mm). Custom Print. >Click on item details to customize it.